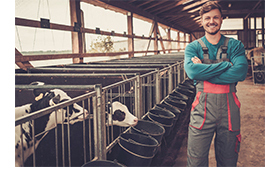 Ritchie-Smith Feeds offers a complete line of dairy nutrition products and services for all stages of life, including lactation (cows), transition (dry cows), calf and heifer. 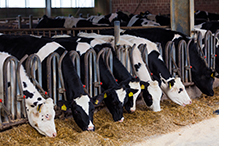 Our dairy nutrition team, comprising four professional nutritionists and six specialized field consultants, helps customers realize full potential in feed forages. We achieve this through specific assays and selecting the optimal concentrate ingredients to fully utilize farms' forages. It means customers maximize their total farm revenue after feed costs. We house our own NIR, where our technicians analyze more than 5,500 forage and 1,500 grain/oilseeds samples annually. Plus, to ensure we achieve optimal accuracy, we leverage third-party wet chemistry labs. As a result, we're leaders in BC utilizing fiber digestibility rates to analyze a three-dimensional view of how forages are broken down in the rumen. Forage analysis in combination with dynamic ration balancing ensures we cost-effectively maximize forage efficiency. To continuously lead the industry with best practices, our nutrition experts and staff frequently review university studies, collaborate with other agricultural professionals — from veterinarians to hoof trimmers — conduct on-site visits to other feed mills across Canada, and attend technical seminars across North America. To discuss how we can help you maximize the health, nutrition and performance of your dairy herd, contact us.